Scott M. Gibson (D.Phil, University of Oxford) is the Haddon Robinson Professor of Preaching and Director of the ThM. Program in Preaching at Gordon-Conwell Theological Seminary. He is past president and cofounder of the Evangelical Homiletics Society. He has served as a pastor and is one of the founders of Cornerstone Church Network. He is a graduate of Pennsylvania State University, Gordon-Conwell Theological Seminary, Princeton Theological Seminary, Knox College University of Toronto, and the University of Oxford . 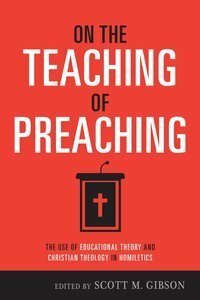 Among his many books are Preaching to a Shifting Culture, Preaching for Special Services, Planning Your Preaching, Should We Use Someone Else's Sermon? and Biblical Preaching Workbook.